38 straights various lengths. The used ones will need cleaning. For sale, a Peco 00 gauge N/S short crossing Mint as new. Peco 00 Gauge concrete Style Points X3. Condition is New. Electrofrog Dispatched with Royal Mail 2nd Class. Item can be viewed or collected from Uckfield TN22. Currently we have over 10,000 products available on line. The cheapest way of transporting will be chosen. Has been opened only to photograph. The cheapest way of transporting will be chosen. Currently we have over 10,000 products available on line. Currently we have over 10,000 products available on line. The cheapest way of transporting will be chosen. DVD's/ Videos. For sale, a Peco N/S "Y" point. Mint, as new. PECO 00 gauge SINGLE SLIP CROSSING. WITH PECO POINT MOTORS. Peco SL-E88 Electrofrog Point Curved RH H0-00. Condition is Used. Dispatched with Royal Mail 2nd Class. Code 75 Electrofrog. PECO SL-E192. Small Left Hand Point. 1:76 00 SCALE. Be sure to add us to your favourites list ! '00' Peco SL-89 Large Radius L/H Point Insulfrog ( Code100 Used )#. This is used but in very good condition. The point has been shortened by approx. 0.25 at the 'feed' end of it but this does not affect the operation of the point. For sale, a Peco N/S curved right hand point. Mint, as new. '00' Peco SL-88 Large Radius R/H Point Insulfrog ( Code100 Used )####. This is used but in very good condition. Two of the sleeper ends have been cropped shorter but this does not affect the operation of the point. CATCH POINTS PROTECT MAIN LINES FROM RUNAWAY VEHICLES BY DERAILING THEM. Add to Favourites. '00' Peco SL-89 Large Radius L/H Point Insulfrog ( Code100 Used )####. '00' Peco SL-88 Large Radius R/H Point Insulfrog ( Code100 Used )###. This is used but in very good condition. Two of the sleeper ends have been cropped shorter but this does not affect the operation of the point. '00' Peco SL-88 Large Radius R/H Point Insulfrog ( Code100 Used )#####. PECO SLE187x2, SLE186x1 00 SCALE Code 75 Electrofrog Curved Points. Selling as used Due to tatty boxes, but these not been out of the packaging for anything else but the photos. Items are now surplus to requirements due to scale change. Dispatched with Royal Mail 2nd Class signed for. '00' Peco SL-89 Large Radius L/H Point Insulfrog ( Code100 Used )###. This is used but in very good condition. Code 75 Electrofrog 3-Way Point. PECO SL-E199. Peco / Right Hand. Here we have selection of 00 Gauge Railway Points coming up for sale. For sale, a Peco N/S curved left hand point. Mint, as new. 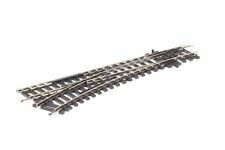 Peco 00 Gauge Nickel Silver Streamline Code 100 SL-89 Left Hand Large Radius Insulfrog Turnout. Nickel Silver left hand turnouts almost certainly unused. New photo to be uploaded. UK despatch only. Goods will be well protected. Peco Streamline Finescale Code 75 00 Gauge Nickel Silver Electrofrog Large Radius Points SL-E189. The points are in excellent used condition with strong switching action. UK despatch only. Goods will be well protected. PECO SL-63 - x 2 FOAM UNDERLAY FOR SL-(E)80 & SL-(E)180 SINGLE SLIP STREAMLINE PECO POINTS - 00 GAUGE. 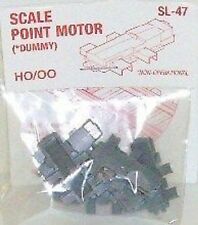 3 Point Motors Vintage Peco Mk 2 Streamline 00/H0 new carded unopened. PECO SL-62 - x 2 FOAM UNDERLAY FOR SL-85 & SL-185 LEFT HAND CATCH STREAMLINE PECO POINTS - 00 GAUGE. Add to Favourites. •Angle; 12°. The cheapest way of transporting will be chosen. •Point Length; 9-3/4" (249mm). Currently we have over 10,000 products available on line. Slot Racers. Currently we have over 10,000 products available on line. Item: Y Hand Points. Used she-worked a lot, condition as pictured. The cheapest way of transporting will be chosen. Currently we have over 10,000 products available on line. DVD's/ Videos. Code 100 Electrofrog. PECO SL-E91.